The painting was written in 1890. Levitan, like any professional artist, always did sketches before writing the main picture. Many such etudes with a lake landscape have been preserved. 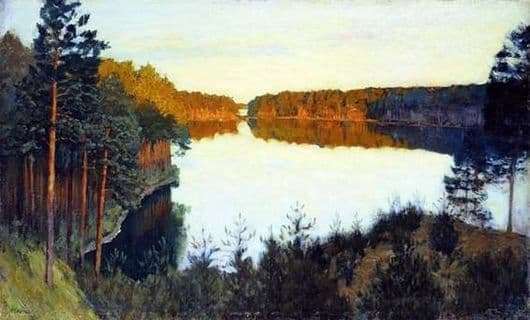 In his picture Levitan depicted the extraordinary nature and versatility of nature. It seems that the foreground is dissolved in the picture. It spreads in the depths of the lake, which reflects the tops of the trees that surround it around. All the viewer’s attention is riveted by the depth of the picture, that is, its background. Yellow and illuminated sunset sun pine outlines the rounded edges of the coast. The use of dark colors by the author shows all the transparency, beauty and mystery of nature. From the left edge of the picture is a sandy beach, which evenly turns into green grass, as if outlining a narrow line that runs between the water and the coast. The trees are very close and densely located near the shore of the lake, as if squeezing it into a kind of ring. The coast is gently sloping, now steep and rising sharply, creating the feeling of some kind of rocky plumb located above the water. The trunks of the pines are bare, high with green tops that do not let in light and sunlight, they give the picture a shadow and thereby recede into the background. With this, the author tried to concentrate the viewer’s attention on his main subject, which was given particular attention when writing a picture – to the lake. Everything is accurately and scrupulously noticed by the author, that one involuntarily marvels at this. The predominance of dark tones makes it possible to conclude that this is the evening dusk. Barely noticeable blue sky with floating clouds, reflected in the lake. The author wanted to show the viewer all the virgin nature and virginity of nature, filling the forest lake with peace and quiet.